"Community Service while Goalkeepers And Field Players Play The Sport They love"
Goalkeepers and Field Players alike can register for free, track stats, upload and share photos. Their passion for scoring goals and goalkeeping, assists and breakaways, or PK saves can turn into life saving research dollars supported by friends and family. It is important to be a good athlete on the field but it is more important to be a great person off the field for your teammates and others in your community. This initiative started with a small group of Football Field Goal Kickers. Their passion and iniatitive inspired others which raised over $200,000+. Athletes and young adults off all ages want to make a difference and help others. Champion For Kids With Cancer gives them the platform. This is an impactful way to play the sport an athlete loves while providing a valuable community service. 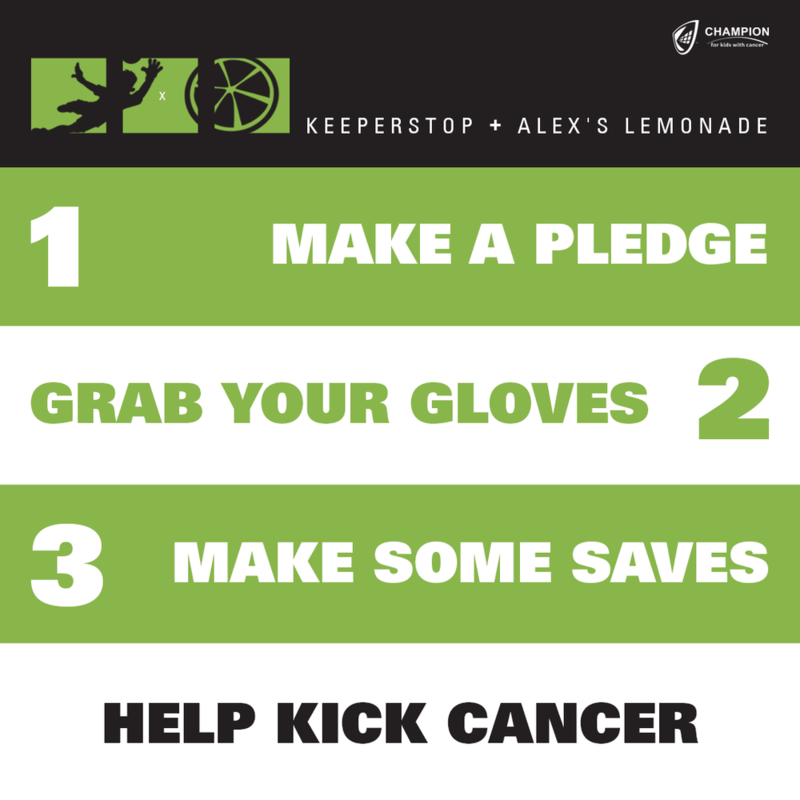 Alex Lemonade Stand Foundation has raised over $150 million for childhood cancer and funded 800 research projects. Champions For Kids with Cancer turns ever game and field into a Lemonade Stand. 1 in 285 will be diagnosed with some form of Pedriatric Cancer. ALSF is the best way to make a difference with a child that would like to get back on the field to save or score goals. .85 cents of evey 1.00 raised goes to support research projects and families in need. Be a leader. Forward the KICK-IT.ORG campaign to your teammates, coaches, and friends playing other sports. Every quarter or dollar helps. Raise what you can. The most important aspects are you are involved, raising awareness, and trying to make a difference. Providing goalkeeper glove and equipment education is great but I really feel the soccer community and GK Union can make a difference. Contact [email protected] with any questions on how to get involved or encourage your team..